Kingfisher Packaging have just been awarded our BRC accreditation for both sites for the 3rd year in a row with an AA Grade, the highest possible achievement. 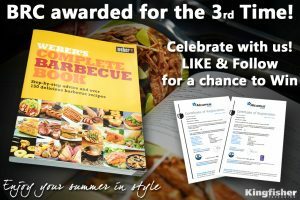 We think this is worth celebrating so we are holding a competition on our LinkedIn page, with a chance to win a “Weber” Cookbook, packed with over 150 delicious recipes that you can cook all year round, and we really want you to join in. The lucky winner will be announced on our LinkedIn page on 3rd July, so make sure you are following us. Contest closes: 3oth June 2017.